Capital Wireless Information Net (CapWIN) Deputy Director, Roddy Moscoso recently wrote an article titled, “Using Virtual Worlds to Plan for Real World Challenges” which was published on DomesticPrepardness.com. CapWIN is a program located in the University of Maryland’s Center for Advanced Transportation Technology (CATT) that was created by, and continues to operate under the direction of a coalition of law enforcement, fire/EMS, and transportation agencies in Maryland, Virginia, and the District of Columbia to advance data communications across agency, jurisdiction, government, and discipline boundaries. 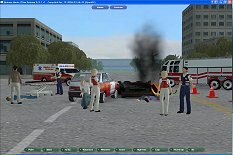 The article discussed the advantages of virtual training for first responders and how the CATT Laboratory has provided this tool and what exciting features it is able to present. The Virtual Incident Management Training developed by the CATT Lab along with the I-95 Corridor Coalition and Forterra Systems, Inc. provides an intensive training program that uses three-dimensional, multi-player computer gaming simulation technology and distance-based learning technologies to test, validate, certify, and reinforce the dissemination of best incident management practices across the Coalition region. The program presents typical incident situations and allows the participants to play out their normal roles in what is essentially a highly structured and recorded video game. In this way traffic management personnel and incident responders can experience a wide array of realistic scenarios, analyze the impacts of their decisions, and be trained about appropriate responses and communication as well as the consequences of inappropriate responses and communication breakdowns.